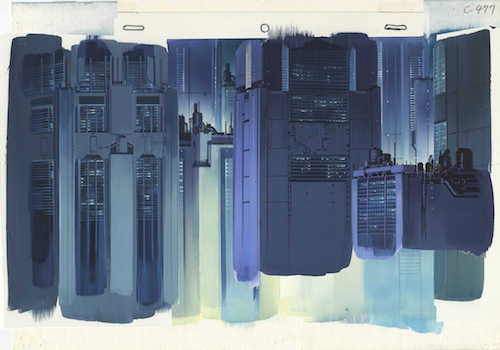 Hiromasa Ogura, Background for Ghost in the Shell (1995), gouache on paper and acrylic on transparent film, 11 x 15". The implicit main character in urban science-fiction narratives is always the city itself—architecture plays an integral and active part in shaping the story. This becomes abundantly clear in an exhibition of original background drawings from three well-known anime films: Patlabor: The Movie (1989), Ghost in the Shell (1995), and Ghost in the Shell 2: Innocence (2004), all directed by Mamoru Oshii. On the first floor, viewers find paintings of cityscapes, ramshackle villages, and postapocalyptic islands, painstakingly rendered with miniature brushstrokes and delicate washes of gouache. These works are often overlaid with transparent celluloid sheets upon which moveable foreground elements, such as street lamps, were added. All done by art director Hiromasa Ogura, the scenes are arresting, melancholy, and deeply uncanny; lovers of Ghost in the Shell will immediately recognize the eerily tweaked Hong Kong of 2029 where Oshii situated the story. A group of drawings on the second floor reveals the paintings’ basis in rigorous architectural studies. Extremely precise pencil renderings by Atsushi Takeuchi and Takashi Watabe, many of which were the foundation for finished backgrounds on the floor below, provide what look like technically plausible designs. In a different context, one would assume these were construction plans rather than sketches for cartoon backdrops. Short clips that include the backgrounds from each movie are also on view; the scenes become dynamic and dimensional when animated by characters, weather, and cinematic effects. After seeing the multilayered process by which their worlds are created, one understands that these films’ sense of depth is no illusion—every frame is undergirded by a whole substructure of beams and pipes.